Being fairly heavily invested in Bitcoin and Bitcoin mining since 2015, I often pause to reflect on what the hell I am doing, especially when seeing my holdings plummet from $2,700 per Bitcoin to $1,850 in a week, only to see it rise back up to $2,800 a week later. I chair a Crypto club of many "serious" Bitcoin investors and we are on an active chat group (together with others I follow), and the volatility these people are prepared to accept without blinking an eye�never ceases to amaze me. They will be offloading their Capitec, Richemont, British American Tobacco shares at the first whiff of a 15% to 20% drawdown, or selling off their investment holdings when the economic situation suggests recession and yet, incredibly, sit through 50% to 60% Bitcoin drawdowns without wavering. These same people, especially those in our Crypto Club, were madly egging each other on to be snapping up Bitcoin without even blinking recently at $1,850 to $1,950, on a scale far more aggressively than they would well-run quality stock market shares that see similar drawdowns. A week later everyone was 40% up on their trades. But here’s the rub - they wouldn’t sell to take the 40% profits, they decided to HOLD. Ironically, they land up the better for it. It’s common wisdom that time in the stock market counts more than timing the market, and the only time when timing works is when you’re buying when everyone else is panic-selling. Almost every JSE or SP500 share purchase I can look back at as having performed way beyond my wildest expectations has invariably resulted from purchasing quality companies "when blood was on the floor" and/or not being scared into selling them on regular bull-market drawdowns. How is it that a risky, volatile crypto-currency like Bitcoin, still in its early days and worth only $50bn in market cap, gets its owners to display the kind of investment behaviour rarely seen among non-professional participants in the stock market? I know about ten youngsters investing agggressively in Bitcoin, some putting 50% to 60% of their salaries into it. Whilst questioning the wisdom of such a focused, undiversified strategy, the common response is that they are in their first jobs and can afford to take these kinds of risks and they are happy with the risk/reward ratios. Most of these youngsters, don’t, nor ever have, invested on the stock market - their first non-property investments are Crypto! Incredibly, their discipline and resolve through Bitcoin drawdowns would make many a older stock market investor hang their heads in shame. It is clear to me that Bitcoin owners are a fiercely loyal bunch with hoarding behaviour of Gollum (from�Lord Of The Rings) proportions. I have first-hand experience of this. My kids, active Bitcoin investors (as are most university students it would seem)�owed me some money for a night out to the movies, so I casually suggested they just transfer me some Bitcoin from their Luno accounts as it was free to transfer Luno-to-Luno. The looks on their faces were apoplectic. "No ways, I’m not selling my Bitcoin, Dad. I’ll EFT you the money!". This was when the psychological phenomenon of Bitcoin holders became evident to me, for essentially the transactions would have involved identical amounts of money. Their biggest fear was no doubt in a years’ time, when (if) Bitcoin went up another 100% they would be calculating just how expensive that movie ticket and dinner was! Having read (and laughed about) the poor guy who threw away his hard drive with 1,000 Bitcoins on it or the first pizza being bought with 10,000 Bitcoin a few years back, I can imagine their fear of falling victim to similar horror stories. Before long, I realised I was exactly the same. When some funds are required for small fix-ups on the cars or house, I would rather sell some JSE shares than my Bitcoin! It’s crazy! I put one of the major reasons down to "HODLING" mentality (spelling intended!). 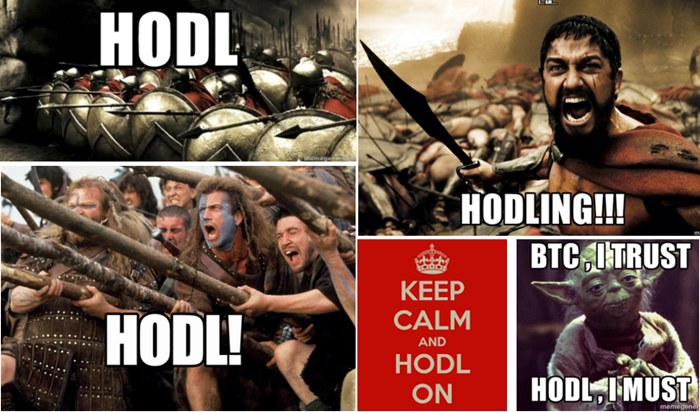 In fact, #HODL is a Bitcoin-specific global internet meme that is often translated into "hold on for dear life", although the true origin was actually a typo when the author meant "HOLD". Now, when last did you see such global community support whenever the stock market was tanking? The mind boggles. But every time investors HODL, they are rewarded with sharp rallies that pretty soon turn into new all-time high records, creating a positive feedback behavioural loop with the Bitcoin owners. This, I believe, is why the Bitcoin price keeps rising, sometimes exponentially, because (1) only 1,800 new Bitcoins are minted a day and (2) nobody wants to bloody sell their Bitcoins and (3) tens of thousands of new people every day want to start owning Bitcoins. And to make matters worse, hedge funds and institutions are starting to get interested too, especially since people have started twigging on that Bitcoin has been declared dead for the hundredth time and bounced back in defiance. Personally, I believe institutional money is behind the curve on this, and it’s their clients that are pressuring them (picture "If you don’t offer it, I’ll do it myself - hell even my kids are doing it! How hard can it be?") But that’s another topic for another day. Interestingly enough, Bitcoin has been the top-performing "currency" in the world in six of the past seven years! 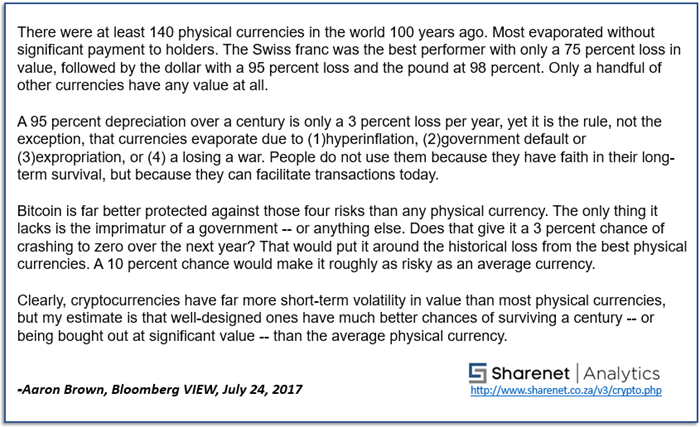 When reading the above, if one agrees with the conclusions of the author, then $50,000 per Bitcoin in the next decade is not as far-fetched as one would think. I read somewhere that if just 1% of institutional money became serious about Bitcoin, the price would need to be worth well north of $20,000 per Bitcoin to soak up the demand given the limited supply.